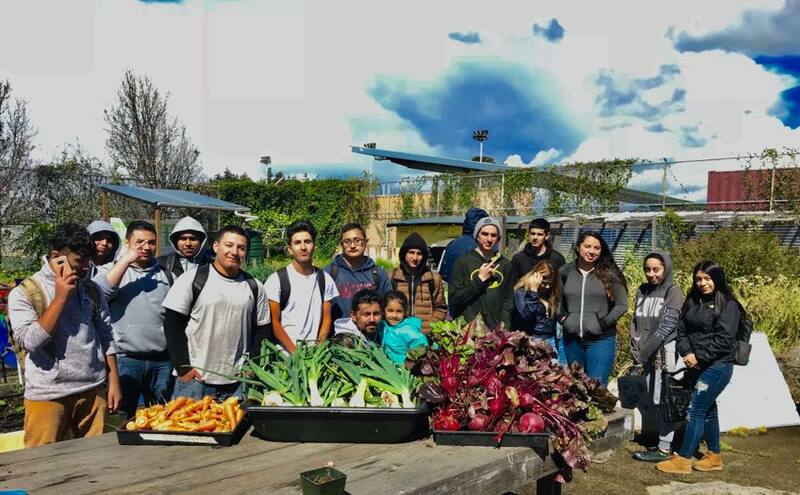 Urban Tilth » Why we joined the fight for Real Climate Solutions! Why we joined the fight for Real Climate Solutions! Earlier this year, I had the pleasure and honor to represent the Western Region of the US Food Sovereignty Alliance at an international gathering of farmers, fisher people, and pastoralists addressing the UN’s position on Food Sovereignty in Cape Town, South Africa. Although the gathering was impactful, it was actually my arrival in Cape Town that transformed my sense of urgency when it comes to the Climate Crisis we are all facing. When I arrived in Cape Town the citizens were under enormous pressure from extended drought. All residents of Cape Town were facing DAY ZERO, the day that this international city with an estimated population in 2018 of 3.8 million people would run out of water. Day Zero was the day when all taps in the City, a city much like San Francisco or Seattle, would have to be turned off and water would be distributed by the government at neighborhood water spigots from imported sources. The signs were everywhere. Showers were restricted to 90 seconds, and handwashing was replaced by sanitizer in the airport restrooms. What was most distressing was the stress and general tension in the air. The underlying stress on the people who were living under this environmental threat was palpable. Although everyone was doing all they could to be kind and cope, it was clear that one wrong move and a major social crisis could erupt. I kept thinking to myself, how did it get to this point? Didn’t the politicians and scientists see this coming? Where was the leadership needed to put a plan and alternative water sources in place, so people’s lives would not be under such a breathtaking threat? It occurred to me that Cape Town was not alone in this lack of leadership and planning for the impacts of ongoing Climate Change. Many communities across the world, including most in the United States, have done little to prepare for the scale and intensity for the changes to our planet that are coming and currently happening. We seem to wait and watch with gaping mouths at each new biggest storm, fire, heat wave, or drought ravages an unfortunate community. We seem to be like the proverbial frog being brought to a boil. Just to be clear, according to all sound scientific data the time has already passed to prevent Climate Change. We should have taken much more aggressive actions to limit and stop emissions decades ago. Sadly, that ship has sailed. Nevertheless, there are things that we can do now to restructure our economy and move towards the regenerative, non-extractive economy we need to navigate this difficult time in our history as humans on Earth. Also, too often government and corporations seem to uplift solutions that show clear potential for profits and not necessarily apparent positive impacts for communities, especially communities who live on the frontlines of the Climate Crisis and those who are low income or communities of color or immigrants who may not be able to bounce back from Climate-driven catastrophes as quickly or as strongly as those who can afford fire insurance, or have other means and other societal privileges. We must be bold and take actions to transform every sector of our economy away from this destructive, extractive mindset that has relentlessly fed this Climate Crisis. From agriculture to transportation, construction, and energy, every part of our economy must be remade so that it is sustainable and regenerative – so life on earth can be sustainable and regenerative. What if food was a human right? What if we worked together to create food economies where those with means helped to make sure those who go without had the same access to high-quality healthy food as they do? What if we reclaimed discarded public spaces to grow food? What if we then trained and employed our young people and those who are left out of the economy to grow that food on those lands, and as a result transform their lives and their communities? What if we nurtured new relationships between urban centers, especially those with food deserts, and small local, family and minority farmers committed to growing organically and sustainably to bring healthy affordable food into our cities on shorter supply chains, using much less carbon-emitting fuels and additives. What if supporting sustainable farming practices could actually sequester carbon rather than increase its emission into the atmosphere? Urban Tilth is committed to exploring these questions, creating initiatives and cooperative community-based enterprises that test these theories. We work to build what we dream and what we need and in doing so, we hope to help change the world. Starting on Saturday, September 8th at the Rise for Climate Jobs and Justice March Urban Tilth will join the fight for the regenerative economy we all need and deserve. Help us leave the planet livable for our children and their children. For more information about Sol to Sol Week of Action or transportation support during Sol to Sol please contact Ravan Huddleson ravan@urbantilth.org.